Amidst the urban valleys tucked between the towering apartments that dominate the skyline of Sejong City’s Cheotmaeul district, a wanderer is likely to chance upon any number of hidden gems. 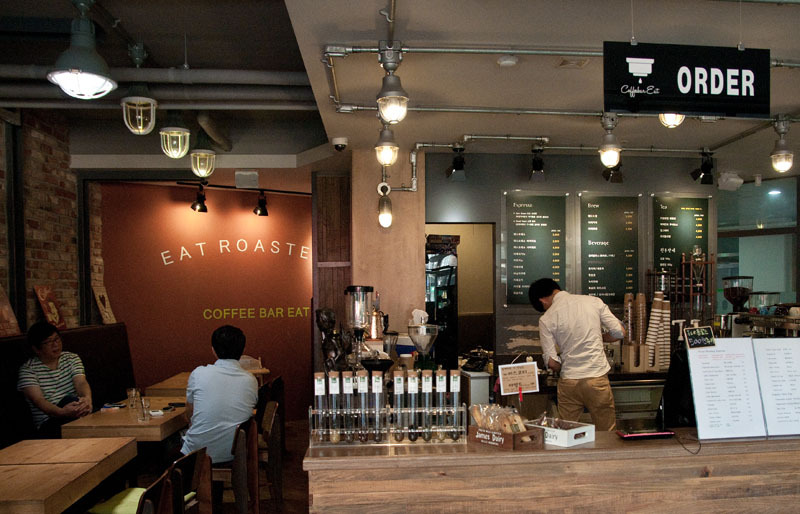 Found in the commercial tunnels that run beneath the apartment blocks is a tiny little café brimming over with aroma, charm, and some darn good coffee: Welcome to Eat Roasters. Smell is an integral part of memory, and it can give cafés a natural advantage. 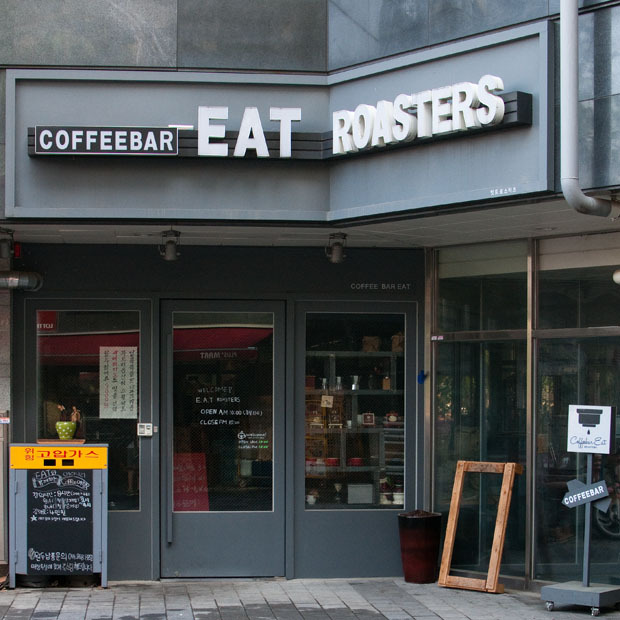 When you walk into Eat Roasters, it smells like you want every café to smell: like somehow they knew you were coming, and, moments before you walked in, they got a new pot of their freshest grinds brewing just for you. The aroma of fresh roasted coffee beans can be a rich and comforting scent; one which is likely to stick in your memory long after you’ve left. Of course, that delicious aroma is due to the fact that Eat Roasters roasts all their coffee beans right in the café. This makes a huge difference when you order any coffee from them. From their espressos to their lattes, and from their macchiato to their Dutch coffees, you can expect every cup to be brimming over with rich flavor and robust taste. 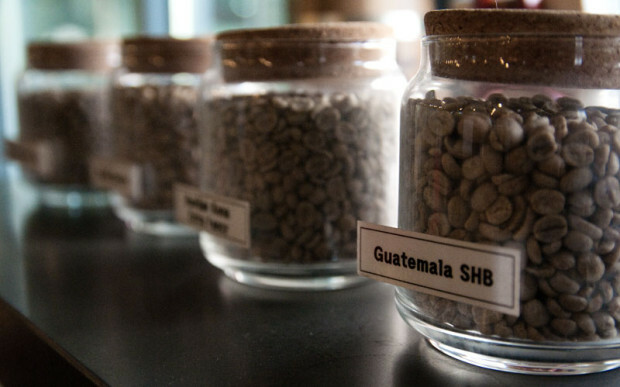 They have a wide selection of beans from around the world, and if you’ve been looking for a place to buy roasted beans to grind yourself, then Eat Roasters has you covered. For ₩6,000 you can get 100g of just one type of beans or for ₩7,000 you can get 100g of the blend of your choice. However, in terms of their drinks The Dish would definitely recommend the Condensed Milk Latte. 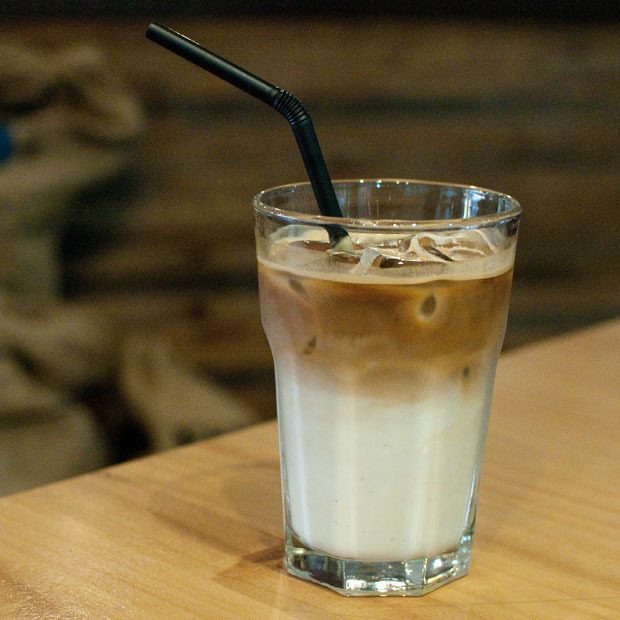 Basically, it’s a latte, but instead of regular milk they use sweetened condensed milk. It is served hot or iced. It’s sweet (but not too sweet) and still allows the flavor of the coffee to shine through. You’re not a coffee person you say? While Eat Roasters is definitely focused on coffee they do offer a number of alternatives worth mentioning. They offer a selection of teas and some rather interesting tea blends. We here at The Dish would recommend the peppermint rooibos, which proves to be incredibly relaxing. You could also try the chamomile medley, peach blossom, or the earl grey. There is an added bonus with all the teas: since they are served in a tea pot, you can ask for more hot water if you want more tea but don’t want to pay for a second cup. Once I ordered the same tea as a friend who had just left, but instead of charging me separately, they suggested I just use her pot again for free. Beyond the teas they offer a few bottled beverages, seasonal fresh juices, citron tea, hot chocolate, green tea lattes, and peach iced tea. They also have a few desserts including affogato, chocolate brownies, New York cheese cake, and biscotti. Personally I’d recommend the affogato, the mixture of rich espresso and sweet, creamy vanilla ice cream was excellent. I’d also recommend the brownie. The brownies at Eat Roasters are not rock hard boulders. They prove to be quite the opposite actually: soft, moist, and warm with just a sprinkling of powdered sugar. They make for a delicious treat, especially when mixed with the affogato. Besides these desserts you won’t find any other foods on the menu, which isn’t a bad thing. You don’t really come to Eat Roasters to eat. This is a place to get some work done, read a little, or meet some friends after dinner. They don’t prepare various sandwiches or honey breads which allows them to focus what’s really important: the coffee. Overall, Eat Roasters has a very cozy feel. Most of the interior is done with various dark woods. There are several book-lined shelves, antique clocks, canvas sacks filled with coffee beans, and large floor to ceiling windows providing a lot of natural light. Various bits of kitschy Americana and large machinery beside the door used for roasting and grinding the coffee beans are also part of the decor. Eat Roasters isn’t huge, (its maximum capacity is about 40 people); but it’s rarely crowded, so whenever you come you’re likely to find a seat. For a larger group, there is one long bench seat against one wall with multiple tables that could hold at least 12 to 15 people. Ideally, it is best suited for small groups of four to five people. Also, if you’re the kind of person that likes to plop down in the corner of a café and work for hours on end you should know that there are not a lot of power outlets. There is, however, free Wi-Fi. Just ask for the password. Most of the employees speak excellent English, and genuinely seem enthusiastic to help out and answer any questions you might have. Directions: From Jochiwon take the 601 or 620 to the first Cheotmaeul stop. Listen for Cheotmaeul ildanji (첫마을일단지). Head down the main commercial street for two blocks. It is under the Cheotmaeul 202 apartment building.